The Beast From The East. Sounds like an Iron Maiden, Live In Japan album. It’s not the sort of name you would ordinarily give to a snowstorm, albeit one that has caused the fluid infrastructure of our country to career to a wobbly halt like a teenage band trying to end a song at their first rehearsal. Scenes of chaos unfold on the telly; cars in ditches, greyed-out motorways at a standstill, an AA man telling you not to travel. A vox pop-stopped random Glasgow bam on Buchanan Street informs us that “Canada can cope with far worse so why are my weans being sent home from school?” – all the usual stuff, really. There’s a sound to snow falling; eerie and wooly yet comforting and cocooning. If it’s snowed through the night, you’ll know it even before you’ve pulled the curtain aside to confirm it. There might be a bright, white glare reflecting from the ground, creeping through the gap in the curtains giving the most fleeting of false impressions that you’ve awakened to a bright and sunny summer’s day. But you know. Call it a sixth sense, but you can feel it. And when you check, sure enough. There’s a fat, car-shaped snowy mould in place of the actual car you parked last night. The grass has been replaced by a blanket of rich, thick white. And the path! A footstep-free path is a beautiful thing. You don’t want to see it spoiled, but you’re sure as hell going to be the first to do just that. 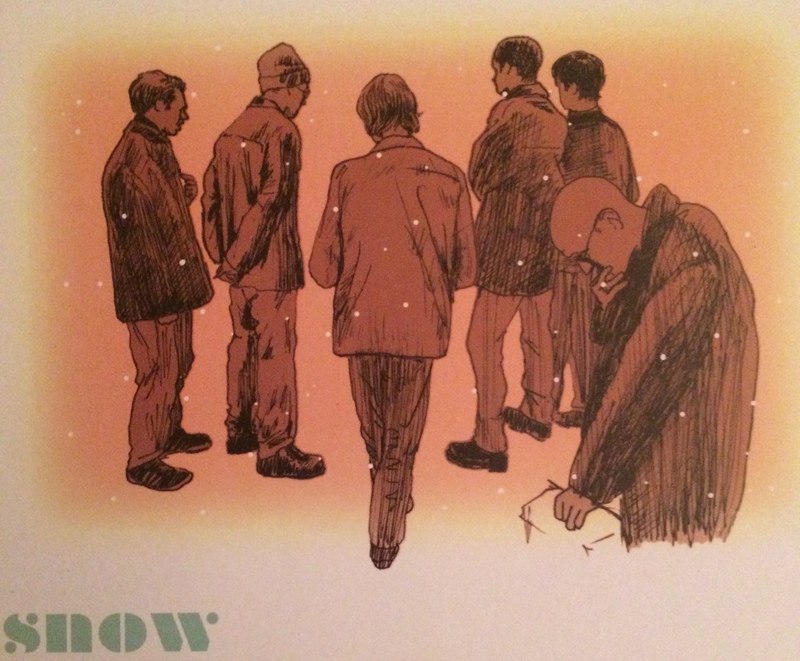 The best records about snow sound like their subject matter. Like Trashcan Sinatras‘ take on Randy Newman’s Snow. It has that eerie and wooly, comforting and cocooning sound. Listening to it, you’re taken to the safe haven of somewhere indoors, watching from a window while a leaden sky dumps its silent, heavy load on all below. Time takes on a whole new metre. You’re living inside a slow motion replay as softly descending basslines and gently beaten floor toms smother you, electric piano and a slide-into-the-ether wah-wah’d guitar giving you the wings that carry you up, up and away from suffocation. If Fleetwood Mac’s Albatross is the beating heart of summer, the Trashcans’ Snow is the womb of winter. I have a super-rare Japanese 7″ of this, an artefact that’s just about as beautuful as the sound that lies in the grooves therein. Just about. 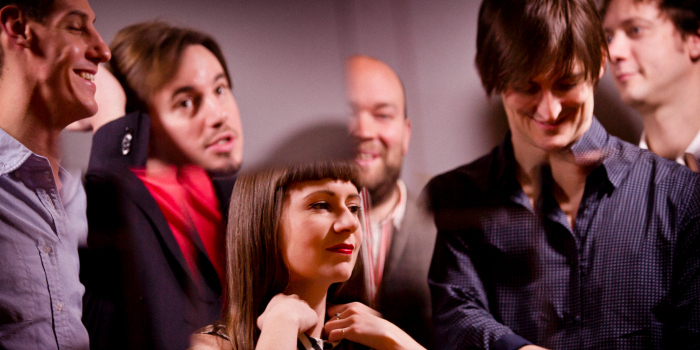 On equal par with the Trashcans is The Leisure Society‘s The Last Of The Melting Snow. By happy coincidence it soundtracked the slow, determined commute to work this morning when it popped up quite unexpectedly on 6 Music. It’s a piano and string-led ode to leaving someone/somewhere for something new. Or, to be more to the point, it’s an ode about being dumped. That’s an unintentional snow reference right there. The Leisure Society’s Nick Hemming wrote the song after meeting up at Christmas with his long-term girlfriend whom he’d recently split from. And the days fade away. In no doubt, as I leave this town, I will not return. Jeez! It’s a heartbreaker alright. And with it’s waltz-time piano and plaintive voice, it even shares loose DNA with Neil Young’s Only Love Can Break Your Heart. Somewhat brilliantly, the song won Hemming an Ivor Novello nomination. The band and Hemming didn’t even have a record deal at the time, making Hemming the first unsigned nominee at the Novellos. Just for the record, he lost out to Elbow’s One Day Like This. For what it’s worth, I think the judges just about got that one wrong. The Beast From The East. It’s a stupid name for a snowstorm really. Unlike Thundersnow. You know what you’re getting with that. Even if Thundersnow sounds like the title of a long-forgotten early 80’s live Ozzy Osbourne album.